Constructed by artisan out of white marble. Crafted in origin of north India by casting technique. Highly durable and wonderfull addition to decor. Bring peace and prosperity in every aspect of your lives. 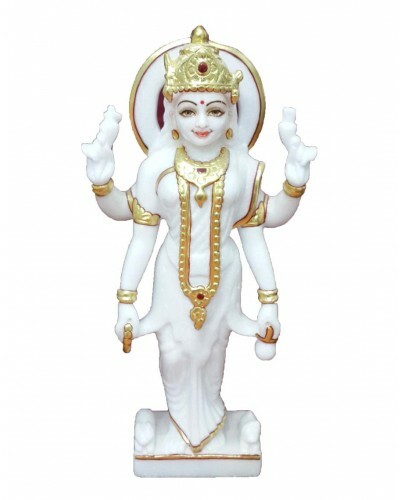 Splendidly carved showpiece and a sacred accessory is a must have for any home. You can conveniently place it in your temple, dining table, or on your shelf. With an intricate design it will also look majestic in your living space. Delicate and exquisite look adds to the charm of this decorative item. Ideal for gifting purpose and would make a perfect gift item for someone you love. Disclaimer: This intricate home decor product is handcrafted and may have slight imperfection and/or mismatch from the product shown in the image as its handcrafted by the artisan which makes the product unique.